Ethical employees are an obvious key to fraud prevention within any organization. But can you ever really know your employees are ethical before you hire them? In its 2018 Report to the Nations, the Association of Certified Fraud Examiners (ACFE) took a closer look at the impact of background checks on occupational fraud prevention. Specifically, they looked at organizations that had experienced fraud and determined; (a) whether the perpetrator had been background checked prior to being hired, (b) whether the background check revealed any “red flag” behaviors, and (c) the extent of the background check performed. Occupational fraud is fraud committed by employees against the organization they work for and is recognized as the most likely form of fraud an organization could face. And, the stakes are high considering that in the 2,690 cases of occupational fraud reviewed in ACFE’s 2018 Report on Occupational Fraud, the total loss surpassed $7.1B with a median loss of $130K. Fortunately, there’s good news. Screening job candidates and employees with background checks offers companies a proactive solution to help identify potential fraudsters before it’s too late. Background checks alone were able to uncover red flags for 1 in 10 fraudsters, putting some control for preventing occupational fraud back into the hands of employers. Yet, employers run background checks less often than you might expect. The 2018 ACFE report found that just over half of companies (52%), ran a background check on an employee that later committed a fraud. By not screening, the residual 48% of employers opted for the riskier option and paid for it in significant losses and potentially even a damaged reputation to the company. So, do background checks actually stop fraud themselves? The answer is that there is no one single way to stop fraud. However, organizations with a mission to prevent fraud to the best of their ability need a comprehensive screening process as part of their larger fraud-prevention strategy. Such a strategy might encompass a number of active or passive detection tools, including internal audits and hotlines. The reality is that every organization is at risk of occupational fraud. Being proactive can help prevent fraud or at least detect frauds before they become catastrophic. Fortunately, background screening offers a proactive measure that, if taken seriously and trusted as an indicator of red flags, could have helped reduce 10% of the fraud cases reported in the ACFE study. Does your company do everything it can to prevent occupational fraud? 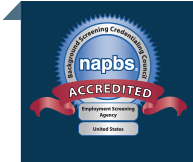 Learn more about industry-leading background check solutions here.